1000 + World Stamps prior 1960 Hitler and more. 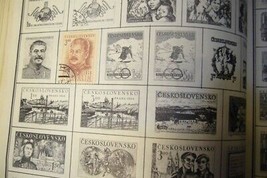 One Thousand plus Vintage Stamps in a Monarch Book dated 1954 so most are early. 54 Countries , including many that have new names now. US Stamps: (3) 1902-03, (2) 1908 - 21, (12) 1922-31, (3) Washington BiCent. (18) 1938-43 Presidential, (6) 1939 -45 Defense Comm. (1) 1946 FDR, (1) 50th Trucking Industry, (1) Susan B Anthony, (4) Antarctica, (8) Blocks of Stamps, Atoms for Peace,New Hampshire,Great Lakes Transportation, Andrew Mellon, Liberty, Ben Franklin 250th. Wheatland James Buchanan House. All stamps are hinged and used except for the 4 blocks.